When life gives you lemons, why not make risotto? Like I mentioned in a recent post, certain dishes refer to a cooking method or technique rather than an actual dish. Such is the way with risotto. Basically, with a risotto you sauté some aromatics, lightly toast a grain (most often rice) and slowly stir in a hot liquid until the grain is cooked and the entire dish is creamy. Here’s my version for spring! You may have noticed lots of ranges on the ingredient list, which is one reason I love risotto. It’s so flexible. Well, it’s sort of flexible. Ingredients, yes. However, once you start it, commit yourself to the stove for a good 30 minutes because you really can’t stop stirring it. Warm stock on a back burner and set a ladle beside the stove. Taste your stock to make sure it is yummy and not too salty–if it’s no good, start over with a different stock. It makes ALL the difference in the world. Heat oil of your preference in a large heavy-bottomed pot over medium heat. Sauté leeks until tender but not browned in the slightest (about 5-10 minutes). Don’t walk away from them. Add rice to leeks and sauté about 3-5 minutes, adding a Tbsp or two more oil if things start to brown. Add the thyme leaves and 1/2 of the lemon zest. You can always add more later if you want. Dump in wine all at once and stir to get everything lubed up. If wine isn’t your thing, just use some extra stock. Keep stirring and once the liquid has mostly cooked off and things start to stick to the pan, add a ladle or two of stock. Keep cooking off the liquid while stirring until things stick again, then add more stock. Keep stirring. Keep doing this for about 20 minutes until the rice is cooked. How do you know? Taste it and chew it. It should be tender but not mushy. Once you’re at this point take the pan off the heat, add the butter and cheese and stir like there’s no tomorrow until the butter is melted. Once the butter is melted, add the peas and gently fold in. Generally, I like to serve risotto with a whole-grain crusty bread to have contrasting textures. 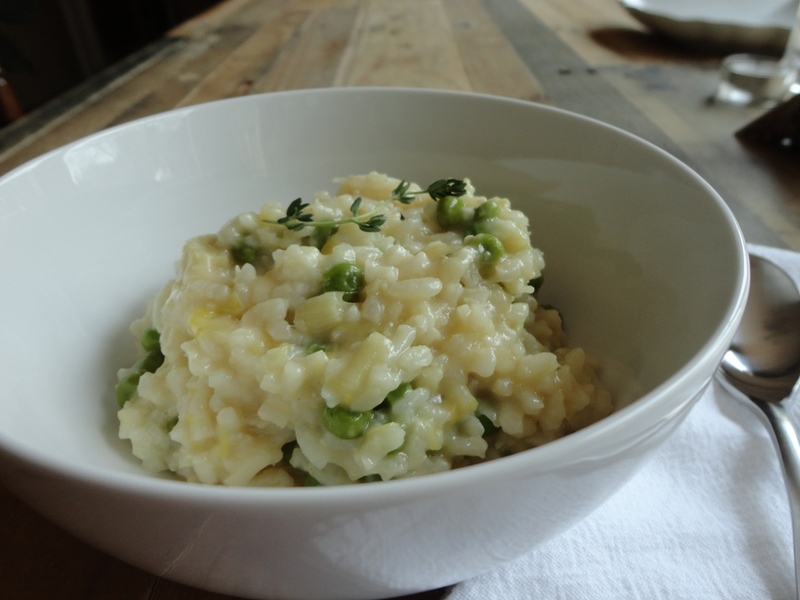 Play with the ingredients and find a risotto that works well for you. Then, tell me about it. I tried this and it was delicious! I added fennel to the leeks as well as asparagus in the middle and marscapone at the end. I like to complicate things as much as possible. However….it took almost an hour for the rice to absorb the stock. I am 100% this was chef error (not recipe) but I’m not sure where I went wrong. I’m thinking that I either failed to toast the rice enough at the beginning and/or that the heat wasn’t high enough. Actually, I’m pretty sure it was the heat. Would that sound right? Anyways, it eventually produced a five-star meal that I will definitely make again! And your tutorial on the leeks was spot-on. Awesome. I tried it again with higher heat so it simmered – PERFECT. Thank you!